This necklace was created for a competition and is way outside my comfort zone but I love that about it. The challenge was to incorporate a doodle or zentangle into a piece of jewelry. So…I started with my favorite Emily Dickinson poem and decided to incorporate a blue bird and a stark tree. I painted the bluebird and zentangle tree on a tiny black canvas. 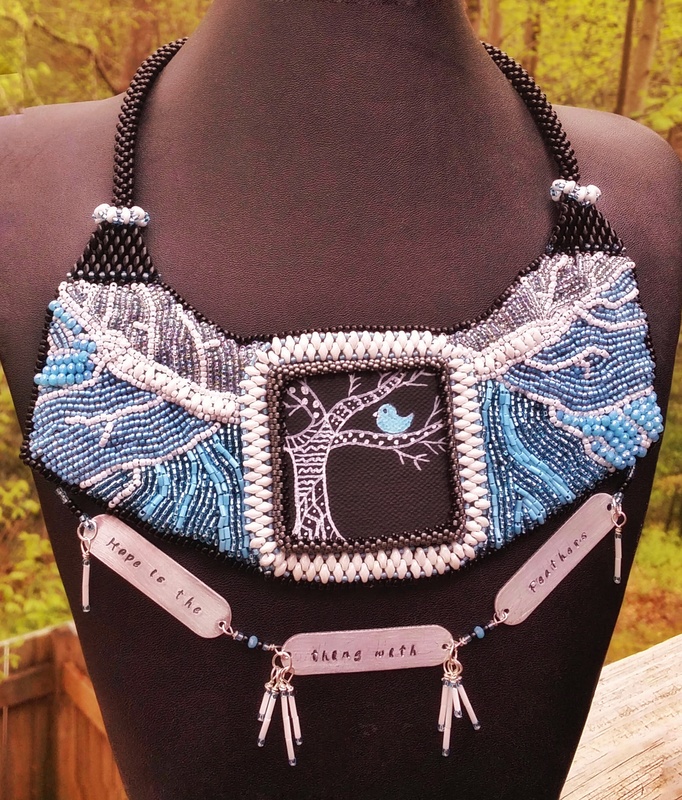 Then I embroidered beads around it, continuing the branches and blue sky. 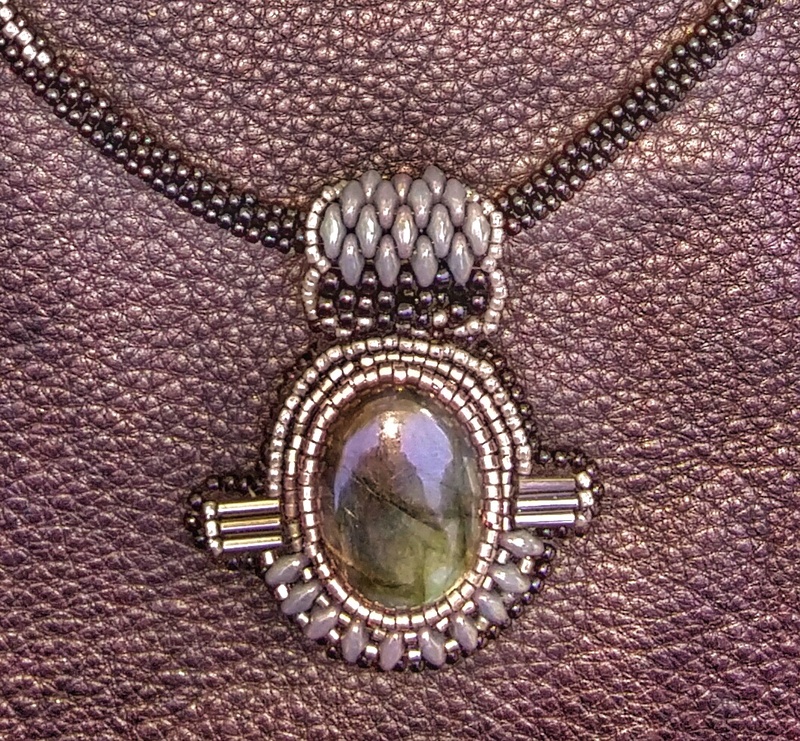 The chain is peyote stitch and toggle clasp is also beaded. In the drop down, I incorporated hand stamped verses from the poem and feather like fringe. I love the colors in Labradorite. Within a tiny movement you can see blues, greens, purples, pinks, grays and golds. This pendant was inspired by a trip to Asheville and some of the Art Deco architecture we enjoyed. It’s weird because I grew up near Asheville but rarely did I ever pay attention to the downtown area. When I was growing up it was a wig store, a few quirky shops and a shoe store. Now I can appreciate the exquisite architecture and, like the Labradorite, many hues and nuances. 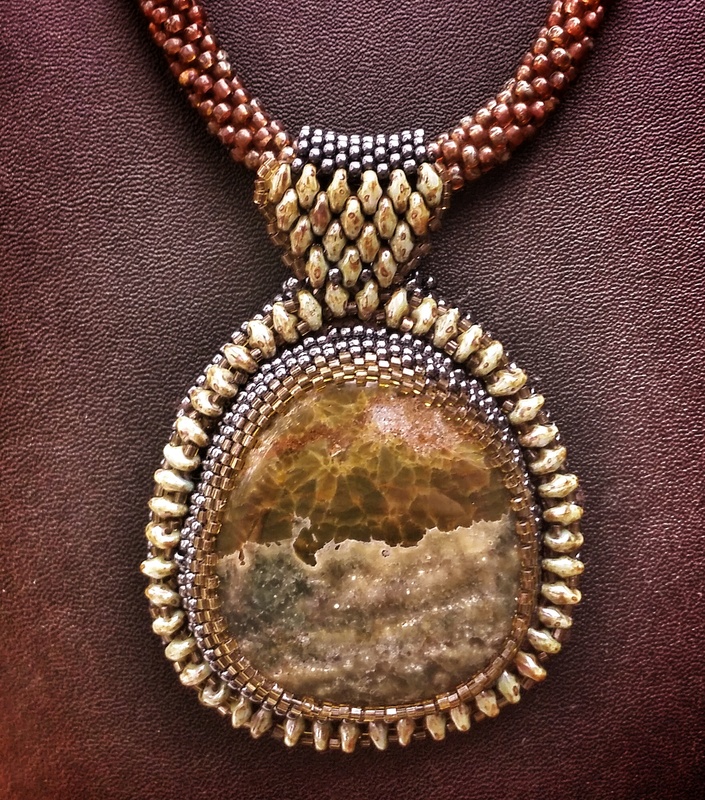 The pendant features Japanese seed beads, Czech glass beads and the Labradorite cabochon. The beaded chain is 20″ long with a hand beaded toggle clasp. For years I have worked in metals and while I still enjoy working with copper and silver, beads are my newest passion. I was so excited to find this jasper cabochon at our local gem store with this beautiful, storm-like pattern on the stone. The cabochon is surrounded by Japanese glass seed beads and Picasso Superduos. The chain is handbeaded with seed beads and the clasp is also hand-beaded.